A year ago, I wrote a profile of Michael Rucker shortly after his first full month as a starter in the Carolina League for Myrtle Beach. Previously, Rucker was a shutdown reliever for South Bend before getting promoted to the Pelicans. Rucker went on to make 15 starts in Myrtle Beach and put up 82 innings in that role for Myrtle Beach with a 2.52 ERA to become the breakout pitcher in the second half of the year in the Cub system. Rucker has terrific command — especially to his glove side — of a deceptively hard fastball that will creep into the mid-90s, and he mixes in two slurvy breaking balls and a moving changeup, all of which are fringe to average. He largely lives off of his fastball and his deceptive, slingy delivery, but he pitched well in long relief and got a look as a starter mid-year. Now at AA Tennessee for 2018, the 11th round pick in 2016 out of BYU is having a very good season starting for the Smokies. His stats are a little misleading. Once you start digging into them, you can see how good Rucker has been on the mound. And, you can also see that he’s just beginning. Yes, he has some things to work on, but he has built himself a nice AA foundation to add more to his pitching resume. Rucker has been pretty consistent this year when it comes to how much action he gets in every start. He averages 84.63 pitches per start while getting in 5.21 innings per start. His shortest start of the year was 4.2 innings while his longest was only 6. Michael averages over 1 K per inning with 43 Ks in 41.1 innings. Of his 667 pitches thrown this year, he has 438 strikes or 65.7%. For South Bend, he was 66% in 2017. At Myrtle Beach last year, he came in at 67.3%. Those are all good numbers, but his walks this year have increased to just over 3 BBs per nine innings. In April, hitters barely hit him with a .216 average. In May, that dropped down to .193. That 23 point difference explains the varying levels of success he’s had this year. For the year, he’s posted a 4.16 ERA. However a 2.86 ERA in May is more indicative of his work across 41.2 innings this year. On April 20 in Montgomery, Rucker was charged with 6 earned runs in the fifth inning where he only got 2 outs before being lifted. Take away that 2/3 of an inning outing and his ERA drops from 4.10 on the season down to 2.85. For the future, the Cubs are developing a new breed of pitchers that I like to call “utility pitchers.” That type of arm can throw in a variety of roles from starter to long reliever, short inning, and setup. Mike Montgomery fits that bill at the major league level while Rucker does in the minors along with Duncan Robinson, Bailey Clark, and Rollie Lacy. For now, though, Rucker should be starting and throwing as many pitches as he can to strengthen his arm and work on his pitches. 1. Increase strike percentage closer to 70%. 2. Decrease walk and home run rates. As of today, his walk rate is 3 per 9 innings. He can get that a lot lower and it will only benefit him. His HR rate needs to be below 1 per game. 3. Increase his workload to over 90 pitches per start and to get into the 7th inning on a regular basis. I don’t know what his role is for the future, but for now, he should be starting at AA and getting closer and closer to Iowa. 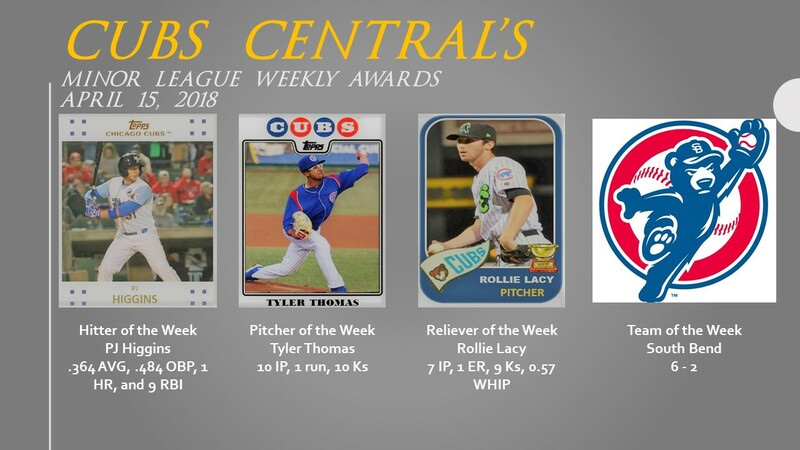 It’s been a rough week in the minors. There were a lot of rainouts and doubleheaders in addition to night games followed by early morning affairs. It was enough to make a prospect’s head spin. As a result, the Cubs’ system did not have a good week. As May comes to a close, the pitching that was dominating hitters in April took a downward turn as the weather warmed up. In April, the Cubs had eight starting pitchers with ERAs under three and several of those eight had ERAs under two. With just 11 days to go in May, the Cubs only have three pitchers with an ERA under 3.00 for just this month. They are Keegan Thompson at 2.65, Michael Rucker at 2.81, and Alec Mills at 2.89. There have been plenty of outstanding starts by many pitchers just this week. Last night, Cory Abbott struck out 11 for South Bend while Thomas Hatch threw a 7 inning complete game shutout for Tennessee. Earlier in the week, Erich Uelmen went six shutout innings for South Bend as well, while Duncan Robinson tossed six innings of one run ball. There’s some great stuff happening on the mound. Maintaining that high level of success is easier said than done. We will see if more can get below that 3.00 threshold to make it onto the May All-Star Team. As for hitting, one would think it would be improving as the weather warmed up. It has a little bit. In April, six Cub position players hit above .300 for the month and Jeffrey Baez posted a .411 average for the span. In May, those numbers increased to eight guys hitting over .300 lead by Tyler Alamo at .366. David Bote hit over .500 for Iowa but that was before his call-up 12 days ago. As a result, he doesn’t have enough at-bats to qualify (3.1 ABs per game). Still, Bote has been extremely impressive at AAA at .455 in just 33 ABs. If you include his 17 MLB plate appearances, he’s at 22 for 52 or .423. Reliever Ryan McNeil debuted for Tennessee this week. The 2012 draft pick missed most of the year down in extended spring training. However, McNeil’s debut saw the release of long time prospect James Pugliese. Drafted in 2011, Pugliese filled a variety of roles at Kane County, Myrtle Beach, and Tennessee. Hopefully he can catch on with another system in a relief role. Infielders Vimael Machin and Yeiler Peguero were also promoted from Myrtle Beach and South Bend, respectively. Their promotion saw the release of long time shortstop Carlos Penalver. Penalver was known more for his defense but had trouble hitting at the plate at Kane County, Myrtle Beach, and Tennessee. Good luck to him in his MLB pursuit. On Twitter, I have been known to tweet out live pitching stats during a game. Well, for about 3-4 days in a row, as soon as I tweeted something out, that pitcher then got knocked around the next inning. It happened to both relievers and starters. I am sure they were just coincidences, but it makes you wonder. Follow the thread on this tweet to see what happened with Dakota Mekkes. On Monday, I’m going to slap a grade on the 2017 draft class. It will be their first one. As for the rest of the week, I am going to let the action dictate the content. I don’t have anything planned for “The Midweek” or The Six Pack.” Although, I do have some thoughts banging around my brain. Maybe you will see a “10 Things I Think” post or a “Prospect Stock Watch.” You could even see an affiliate update. After Memorial Day, I will be doing some phone interviews with a few Myrtle Beach Pelicans. I always look forward to talking to the players and reporting back on their career paths and stories. I don’t have a definite list of who I’m going to interview, but Pelicans announcer Scott Kornberg and I talked about a few players that fans might want to know more about. With the MLB draft just two weeks away, I’ll be pouring through some mock drafts and rankings this week. Right now, there’s not a lot of consensus on where players will be falling after the first few pics. As a website, Cubs Central has never been static. I do make changes on what I hope are improvements from time to time. This week I removed the Prospect Pictures and Video Page that was filled with images I took myself. They are now placed in albums on the Facebook page. In addition, I am in the process of uploading any videos I took to my YouTube account (that could take awhile). I am hoping it just makes for a cleaner experience and as it created a lot more memory on the server. It is 10 days into the minor league season and I’m not sure what I am looking at it just yet. Starting pitching was supposed to be the strength of the organization and the performances have been a mixed bag. There are a few exceptions, but it’s been the relievers that have dominated on the mound. As for hitting, some familiar names are off to slow starts while some players I thought would break out are doing so. Despite some of the struggles, there is a lot to like about what transpired for several prospects. Jared Young was hitting .600. He settled back down to earth but he is off to an amazing start to the year hitting just a little under .400. He still needs to work defensively on playing first base as I think he is going to be there more than at second base this year. The South Bend Relief Corps – To a man, they’ve been lights out. Rollie Lacy, Bailey Clark, Brian Glowicki, Ben Hecht, Brendan King, and Elvis Diaz all have ERAs under 2.25. Michael Rucker – He has always been a strike throwing machine and he started off that way again this year. In his first start, he went five innings with 6 Ks and allowed 1 run. He makes his second start today. Alex Lange – He looked alright in his first start as he gave up one run in five innings. They were glimpses of his brilliance. He looks like the first real deal pitching prospect the Cubs drafted in Theo era. He is still working on his changeup and I hope to see more of that today. Duncan Robinson has been very good as well. His first start was rained out after two innings but he dazzled in his second start going 6 innings with 4 Ks and he allowed just a single run. PJ Higgins – He has been outstanding in a second go around in the Carolina League. With the large amount of catchers that the Cubs have in the system, he may not be going anywhere for awhile and that might be the best thing for his bat. At BP Wrigleyville, I said South Bend would be the team to watch in the first half of the year and they are making me look good. They are 6-2 on the year so far including coming back from an 8 run deficit early in the week. Tyler Thomas changed his name and is stretched out as starter. He was fabulous in two starts. He went five innings in each one while only allowing a run. In his second start on Thursday this week, he no-hit Bowling Green for five innings. He has 10 Ks on the season and a 0.90 ERA. Andruw Monasterio, Eddy Martinez, Zack Short, Bijan Rademacher, Taylor Davis, Ian Rice, Jesse Hodges, Teddy Payne, Austin Filiere, and Jhonny Perada are all off to good starts at the plate. So far, Jason Vosler of Tennessee is the only player with 2 HRs. In Extended Spring Training – A whole new set of players arrived from the Dominican this week to fill out a second squad of players who will mostly end up playing on one of the Mesa teams this summer. Some of the more prominent names to come to Mesa include position players Luis Verdugo, Fabian Pertuz, Orian Nunez, Alonso Gaitan, and Carlos Pacheco along with pitchers Didier Vargas (0.99 ERA in 2017) and Riger Fernandez. Players of the Day are also tallied in their own tab above. I have had a bit of a case of writer’s block since the hoopla of opening week passed. I am ready to go now. I will be checking out Alex Lange’s start today to see if I can do a write up on his second start of the year. A prospect stock watch will be coming later in the week along with 10 things I think. The Friday six pack returns after 7 months on its appropriate day. Dylan Heuer of the Iowa Cubs snagged this dandy of outfielder Bijan Rademacher. Don’t forget to keep up with the cards as they are stored in albums on our Facebook account. There are almost 90 cards so far in the April folder. Last year’s Tennessee Smokies looked to be on the verge of a trip to the playoffs in late May before a collapse in early June. This year’s team should be comprised of talented prospects who could help the Smokies return to the playoffs for the first time since 2011. An elite pitching rotation will set the foundation and a couple of possible power bats could put them over the edge. 1. Starting Pitching – With Thomas Hatch, Adbert Alzolay, Trevor Clifton, Duncan Robinson, Oscar de la Cruz, and Michael Rucker, the Smokies have some guys who have the potential to get a lot of outs. Five of the six were teammates last year at Myrtle Beach for a short time. I’m looking forward to see how well Trevor Clifton begins the year along with Thomas Hatch. I still think that Robinson is going to surprise even more people along with Rucker this year – They can really put the ball where they want in the zone. As for Oscar de la Cruz, he just needs to stay healthy. 2. Time – This is going to be a team that’s going to have to have plenty of time to play at this level. The fact that there are very few prospects at Iowa who could make their way to Chicago this year, there’s really no place for the Smokies to go, at least in the first half. 3. Staying Healthy – It is said all the time, but it’s really an understatement of how much health plays a factor in a prospect’s career. For Oscar, he has not topped 73 IP in a season the past three summers. 4. Bouncing Back – For some of these players, a poor second half in 2017 was hopefully just an aberration on their road to the majors. While Trevor Clifton stands out as a prospect who needs to bounce back, Jake Stinnett is another arm whose career might take off in the bullpen. Zach Hedges even looks like he will be in Kodak again. Hedges just needs to get over the AAA hump as he does do well in AA (2.47 ERA in 2016, 3.49 in 2017) in a starting role. He pitched in relief in big league games this spring. 5. Who Comes Up – Alex Lange is going to be knocking on the door fairly quickly to come to Tennessee. The right hander’s curve might be a little overpowering for the class A Carolina League. The only issue is whether he can develop a third pitch. If he can, he could be in Kodak by the end of May. 6. Impact Bats – It looks like Ian Rice is going to begin the year Tennessee. If he does, I feel sorry for Southern League pitchers. Shortstop Zack Short is another bat who has power and plate discipline. I think this is the year that Eddy Martinez really takes off. Eddy had a great second half at Myrtle Beach hitting over .270 with 6 home runs. The Southern League is a bit more hitter friendly and should be for Martinez. Jason Vosler, Charcer Burks, and Yasiel Balaguert return as a result of a roster pinch at Iowa and they could all provide a lot of power. 7. Defense – The players that were Pelicans last year had some defensive issues down the stretch. Those need to be improved if some of the players plan on moving on to Iowa. Then again, Trey Martin is back and, when he plays, he can get most everything hit his way in the outfield. 8. Bullpen – This is really the strength of the team. There are a lot of power arms and a lot of guys who have wiffleball repertoires. They could turn every Southern League game into a five or six inning affair. With Jake Stinnett, Scott Effross, Preston Morrison, James Norwood, Dakota Mekkes, and Tommy Nance, they’re going to be a lot of disappointed bats at the end of games. 9. Beat Chattanooga – The Twins AA affiliate will be the team to beat. For the Smokies to make it to the postseason, they have to get past Chattanooga. 10. Attrition – Last year, manager Mark Johnson had to deal with a lot of attrition from players moving up, players getting injured, and players who were burnt out. This year, there’s a little bit more depth in the bullpen and position players in the system that should stave that off. WIth 7 or 8 guys who can start on the mound, the Smokies should be good to go. It has to be Mekkes. He’s just a stud and so hard to hit. If he can keep his walks down, he’s not going to be around the minors very long. Considering the strength of the bullpen at Tennessee, they will be just fine. It should be an exciting year to watch these Smokies develop. If you look at any Cubs prospect list of the past two months, most of the top 10 prospects are right-handed starting pitchers. It is the deepest part of the Cubs system and should begin producing arms for the majors in the next year or two. In both the 2016 and 2017 MLB Drafts, the Cubs targeted starting pitching, more specifically, starting college pitching. In addition, the Cubs mined the Mexican international free agent market which is producing quality arms who could be just a couple years away. Considering that most of the Cubs’ actual major league starting pitchers are signed through 2020, the Cubs still have time to get these prospects developed. They don’t have to be rushed. There are 46 starting pitching slots in the Cubs minor league system. 34 of those 46 are right-handed. That is an overwhelming number. Here are last year’s top ranked right-handed starters. What a difference a year made. Injuries, sub-par performances, late starts, trades, moving to reliever, rising prospects, and a host of other reasons derailed most of this list in 2017. Only Jose Albertos had a good year. Then again, Adbert Alzolay shot past almost everyone of them. Now, add in all the arms the Cubs took in the past two drafts and it is a quandry to pick only 12 for this list. I have a feeling that if I ranked these arms every month of 2018, a dramatic fluctuation would occur monthly. Names like Jeremiah Estrada, Erich Uelmen, Keegan Thompson, Kyle Miller, Erling Moreno, Bailey Clark, Zach Hedges, and Erick Leal could make the decision process very difficult for me. I can hardly imagine how hard it is going to be just to pick 6 for the monthly all-star teams this year. Right now, there’s not a lot of differentiation of talent between them. It will have to be about performance this year for a pitcher to separate themselves from the pack..
12. Michael Rucker – He began 2017 as a reliever at South Bend and was dominating. He got promoted to Myrtle Beach and did the same. An injury to Oscar de la Cruz opened the door for Rucker to start and Michael never looked back. His ability to throw 2/3 of his pitches for strikes helps. I don’t know if he will stay a starter this year, but he looks to have a future regardless. AA will be a tough test for him. 11. Duncan Robinson – I really like this guy. He was in the bullpen in April for South Bend and staring in May. He finished the year at Myrtle Beach showing an impressive ability to adapt as he put up a 1.80 ERA in 4 August starts. At 6’6”, he has the frame to withstand the innings needed and intellectual intangibles needed to make it to Chicago. AA is going to tell just how good his curve, cutter, change, and fastball are. I would not be surprised to see him add a fifth pitch this offseason. 10. Javier Assad – After Adbert Alzolay, no pitcher improved as much as Assad did last year. He began the year a bit wild but was throwing mid 90s with control by the end of the year. His fastball quit tailing up and in and he was putting hitters away as he struck out 72 in 66 innings. He will be at South Bend in 2018. He needs to continue improving at each step. Outside of Albertos, he is the pitcher I look forward to the most at South Bend. 9. Cory Abbott – I love his makeup but I also was surprised at how big he is on the mound. He made 3-inning starts for Eugene last year and I was impressed with his work over just 14 innings. He whiffed 18 and his slider looks good. When he gets unleashed in 2018, he could be a breakout arm just a year after being drafted. 8. Trevor Clifton – 2017 was a tale of two halves. First half – All-Star. Second half, not so much. I thought for sure he was headed to Iowa in June after putting up a 2.84 ERA in 66 innings at Tennessee. If there is one thing I like about this kid it is that he will out work anyone. He will be back in 2018 and he will make adjustments. Not every path to the majors is a straight line. Sometimes, there’s a bump in the road. I remember a young arms several years ago who fans thought was washed up as a prospect after posting a 4+ ERA at AA. Sonny Gray turned out OK.
7. Duane Underwood – There were times last year that Duane Underwood of 2017 looked like Duane Underwood of 2014-2015. The velocity was there. From the middle of July to the end of August, he looked studly as he finished a season of 130+ innings healthy. As the year went on, his innings increased and his walks decreased. In fact, his was walk rate was cut in half from .475/inning in May to .27/inning in August. I am really looking forward to seeing him get back at it in 2018. Don’t be surprised to see any of these arms become one of the top six quickly. I really like Assad and I like Bailey Clark, who did not make this list. Regardless of what their name is, the Cubs have a plethora of arms who are going to have to dominate to get themselves noticed in a crowded field. I will be back next week with the top 6 (It will be on Thursday due to the Convention) and a list of arms to keep an eye on next summer. For three young pitchers in the Cubs system, AA will be the ultimate test of their skills in 2018. All three were taken in the 2016 MLB Draft and all three will arrive in Tennessee after taking strange paths to get there. The Cubs system has not produced any sustained starting pitching they signed as prospects. To date, only Pierce Johnson, Adbert Alzolay, and Paul Blackburn pitched what I would call dominant seasons at AA. Zach Hedges and Trevor Clifton each threw a ½ dominant season in 2016 and 2017. It is not easy. For Duncan Robinson and Michael Rucker, both began 2017 as relievers in South Bend. Robinson would up in the rotation in May while Rucker was lights out in the bullpen. When both went Myrtle Beach in the middle of the summer, Rucker got the chance to start in place of Oscar de la Cruz and never relinquished the role. Robinson, meanwhile, adjusted well to the change in play after a couple of rough starts and turned in an outstanding second half with a 2.37 ERA in 8 starts. Rucker’s second half ERA was 2.81. For Hatch, the pseudo-first pick of the Cubs in the 2016 draft, he did not pitch that first season and began his pro career in 2017 at Myrtle Beach. It was as inconsistent a season as one could expect. Hatch did add a 4-seamer to his repertoire but Hatch struggled to get past five innings. Only three times did he make it into the sixth inning, usually throwing 80+ pitches every night. He did pitch seven innings once and eight another time. Once, he struck out 13 in 5.1 innings. His K rate for the season was a very good as he struck out 128 in 124 innings. The key for both Rucker and Robinson is strikes. Rucker’s strike percentage is 67%. That’s outstanding! Robinson is not far behind at 65% while Hatch is at 63%. Looking at their walk rates, Hatch walks 3.61/9 while Robinson is at 2.74 and Rucker at 2.03. At AA, it is going to be crucial for all three to pound the zone. AA hitters won’t chase as much high A and they are patient enough to wait for a pitch they can do something with. Being that all three arms are just two levels from Chicago, it is also important to work in some serious innings. Hatch threw in 124 last year while Rucker only got in 96 after relieving the first two months of the year. Robinson got in 126 after relieving in April. Getting innings in the MiLB is essential to building arm strength for the MLB level. They hopefully can build to 140 IP in 2018 and 160 in 2019. What doesn’t get talked about enough at AA is the adjustment that starting pitchers have to make. 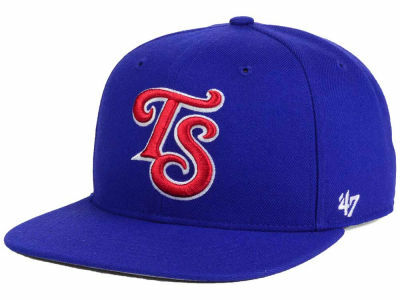 The Tennessee Smokies are the first stage where starters are on a 5 man rotation. That’s a huge shift from the 6 man staff in A ball and even more so from college where starters get the ball once a week. For some, “dead arm,” or arm fatigue, becomes a daily struggle to overcome in the second half. As for future success at AA, Robinson has two things going for him that would enable him to have success at Tennessee. First, he’s a pretty smart cookie. Second, he can adapt easily. He knows who he is as a pitcher and he’s not afraid to change something to improve his lot in the organization. Last year, he added a cutter. I would not be surprised to see him add something else this year. For Rucker, I like that he throws strikes and throws a lot of them. Whether he stays in the rotation or heads back to the bullpen, the skill to put the ball in the zone will get him to Chicago sooner or later. Out of the three, Hatch easily has the best movement on his pitches. Despite being drafted the same time as Rucker and Robinson, he’s sort of a year behind in the learning curve department. He did throw over 130+ innings his junior year at Oklahoma State in 2016. As a result, the Cubs kept him on the sidelines after signing him due to the fact he missed all of 2015. While the Cubs were being cautious, Rucker and Robinson’s experiences at Eugene allowed them to produce for the summer as potential arms for the future. Hatch’s numbers last year look better once I start rooting around deeper. While he had an ERA of 4.04, his FIP was an outstanding at 2.95. That’s a huge difference. His groundball rate was very good at 45.7% and he allowed just 2 HRs all year long. his walks per nine inning stat was a bit high at 3.47 and hitters averaged .347 on balls in play. That’s extremely high. And when hitters made contact, almost 50% of balls were pulled. Hatch’s pitches are good enough that he should be able to make adjustments this year. Just how good he can be is the bigger issue. 2018 could be the summer of the starting pitcher in Tennessee. These three arms will go along with a rebuilt Erick Leal to be the foundation of a nice rotation. Trevor Clifton or Oscar de la Cruz could be joining them. That will all be sorted out in spring training. For now, these three arms will be tested at AA beginning in early April. This has been the slowest off-season I can remember. Not that the Tyler Chatwood is a major signing, but at three years and $38 million, that is not what Cub fans expect to see added to rotation. This week, left-handed pitcher Kyle Ryan announced on his Twitter that he had signed with the Cubs. Ryan was excellent in 2016 but not so much in 2017. What the Cubs seem to be doing most this offseason is building bullpen depth at AAA Iowa. And to be honest, that has been standard operating procedure the last five years. Jim Callis of MLB Pipeline was on 670 The Score’s “Inside the Clubhouse” yesterday morning. He talked about Cubs and White Sox prospects. Callis called shortstop Aramis Ademan the Cubs best prospect. He called him “more of a solid player than a potential star.” He also talked about the Cubs pitching and that he did not see any immediate help for pitching other than Maples. While Callis did talk about Zastryzny and Tseng, he thought of those two more as pitching depth than someone they can count on to stay in the rotation. He added he liked Albertos and Lange but intimated that those two have more questions than answers at this point in their careers. As the holiday season comes to a close on Monday, I always like to look back at what posts were the most popular for the year. I am always surprised at the articles that get the most traffic. Just when I think I know what type of post gets the most attention, I get proven wrong every time. 2017 was no exception as the most popular post in the history of Cubs Central was published. A draft profile of high school picture Alex Scherff destroyed all previous records. I just find it odd because the Cubs did not select him. Most of the traffic came after he was selected in the draft. Considering Boston took him, I am going to assume that much of the interest came from the Red Sox fans. Watching a player break out is always exciting as a fan and a writer. This year, three Cubs pitchers had profiles that put them in second, third and fourth place. Pitcher Michael Rucker came in second place with a profile on his breakthrough performance at South Bend. Ironically, he continued breaking out at Myrtle Beach after moving into the rotation. Eugene’s Bailey Clark had a magically frustrating start that put him in third and a Zach Hedges update from early in the year garnered a lot of traffic. Another top post was actually my favorite interview of the year with Austin Upshaw. The young infielder from Kennesaw State has a beautiful swing and a great head on his shoulders. The return of catcher Will Remillard was one of my favorite posts of the year as I have always been a big fan of his going back to Kane County in 2014. After missing 2.5 years, his bat came back with a vengeance. Two posts about breakouts made the top ten – one was on possible second half breakouts and the other was on why breakout pitching prospects were getting hard to find. Coming in at number 9 was a post from just two weeks ago on the top shortstops in the system. Also a prospect profile of outfielder Eddy Martinez prior to the 2017 season came in at number ten. Given a few more days, Zack Short’s Leveling Up Series post would get in. If you have some free time this week you may want to go back and revisit some of these articles. Thanks again for reading. On Wednesday, Duncan Robinson, Michael Rucker, and Thomas Hatch get profiled in the “Leveling Up” series. On Friday, relievers get broken down in the position breakdown series. Hopefully, there will be a transaction of some sort this week and it will be a starting pitcher. Maybe it will be Darvish or it could even be a trade. As for January, The leveling up series will continue on Wednesdays with the position breakdown series on Fridays except during Convention week, when they both get moved up a day. 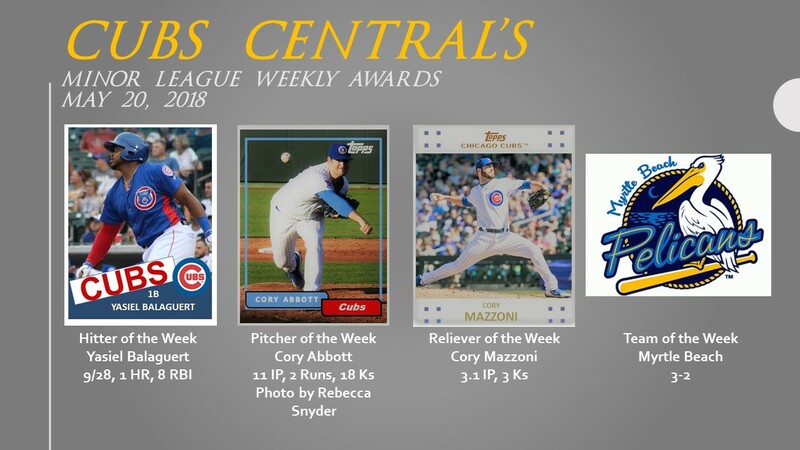 Also, you can check out the cards I made with new templates this offseason over on Cubs Central’s Facebook account.